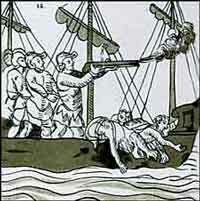 From Potonchan, the fleet pressed on to the Isle of Sacrifices where Juan de Grijalva had landed the year before. 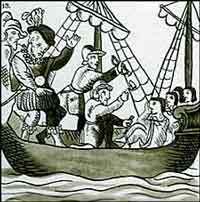 Cortés was received warmly there by the Totonac people. The Totonacs remembered Grijalva, who had been careful to be kind them, and thought that the Spanish might become allies in their war of liberation against the Mexicans. Several days later, the steward of the great king of Mexico, Montezuma, arrived. The steward's name was Teudile, and, like all functionaries of great kings, he was very aware of his own high status, gorgeously turned out in a parrot-feather cloak. Montezuma had instructed his steward to supply and feed his guests, and to offer them gifts of precious stones, and featherware. As he conveyed Montezuma's will, Teudile put a damp finger to the earth and raised it to his lips ("to eat dirt" was a gesture of respect in Aztec diplomacy), then he lit incense, and, to the Spaniards' surprise, bled himself and offered them his blood on straws. Cortés presented himself as the ambassador of a king who ruled "the greater part of the world." Cortés asked after Montezuma. Teudile replied he would send a message to Montezuma to find out his wishes. Cortés then gave the Aztecs a demonstration of his guns and horses. His cavalry charged along the beach at full tilt with swords flashing and bells tinkling. If that were not intimidating enough, the big cannon were fired, at which Teudile and his men literally fell to the ground in fear. The Spaniards bind Montezuma's messengers. The Spaniards fire guns and the messengers faint dead away.